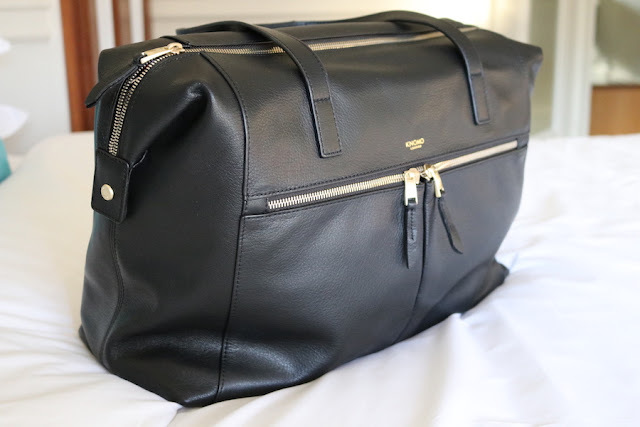 Stylish well-made travel bags are SO hard to find. 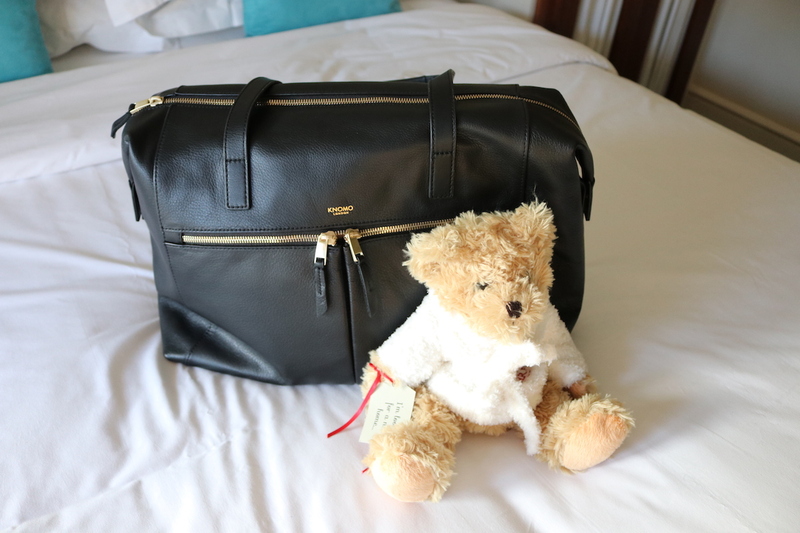 Until recently I had a simple Cath Kidston large bag as my carry on luggage for my travels. It did the job but was rather basic and was quite uncomfortable on my shoulder if I had to carry it for a long time. 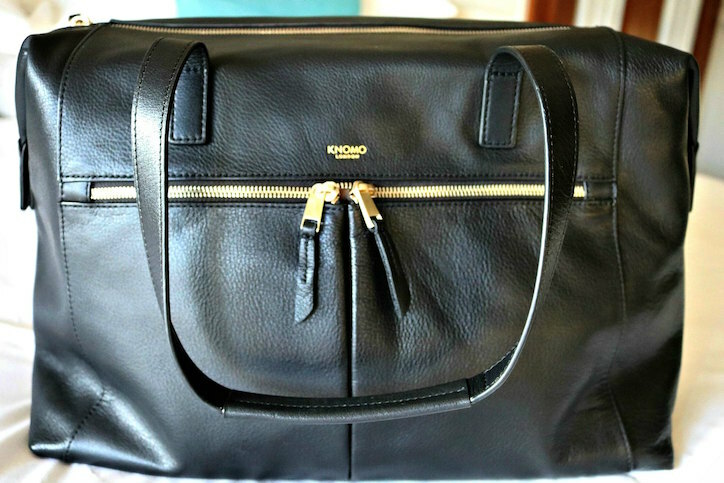 So when I was offered to review the Knomo Curzon leather tote bag I was really looking forward to trying it out. 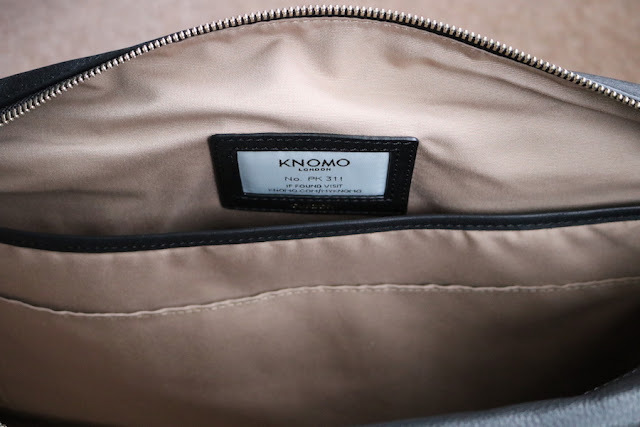 Knomo London is a luxury bag and accessory company that make top quality items with the emphasis on the detailing and exceptional design. They focus on making bags that make every day easier, by having brilliant organisation features, including hidden pockets and multiple pouches to efficiently organise your life. The first thing that struck me when I saw the Curzon leather tote bag was that it seemed incredibly spacious. Measuring an ample 39.5 cm wide, 16cm in diameter and 27cm high, this bag is a really perfect size for a travel bag, the type where you can put everything in for your weekend away. It may not look that spacious but in fact, this bag is like Dr Who's Tardis due to its clever design. Firstly the outside has two front pockets that have lovely strong zips. There is nothing worse than a dodgy zip! 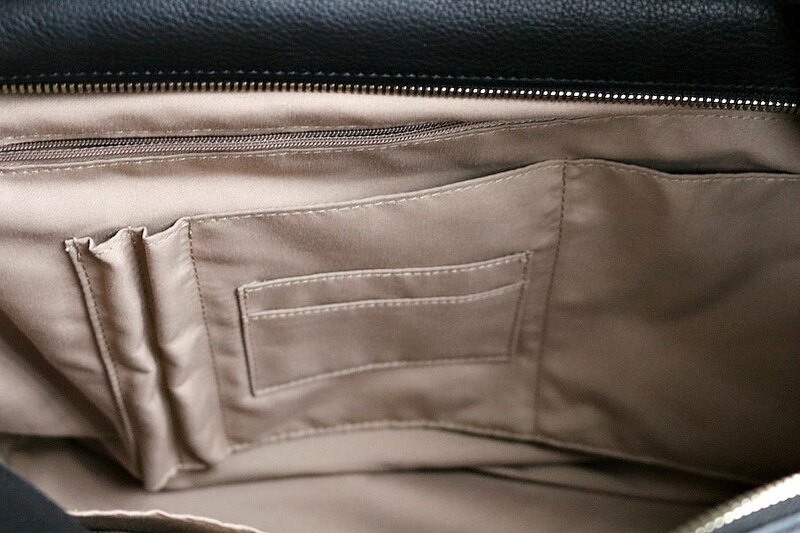 These front pockets also have RFID blocking technology. This helps protect you from 'electronic pickpocketing' from RFID skimming - reading the electronic chips that are in some credit cards passports and driving licences. Such a clever idea. Secondly on the other side of the bag is another compartment with a strong magnetic popper, perfect to pop in a book or magazine. Then the bag opens really wide. On the inside right, there is a large compartment, which is slightly padded and perfect to slip in your laptop, I can comfortably fit my 15inch Macbook pro inside with lots of room to spare. Also on this side is another large pocket, big enough to hold a book, Filofax or organiser perhaps. On the inside left, there is a secure zipped compartment approximately 30 cm in length. Sewn into this side are two small pockets, suitable for your phone or a small purse, two credit card compartments and two pen compartments. This bag is undeniably fabulous. It is made of soft leather and oozes quality but what I was particularly impressed with was the finishing - the stitching is even, and dare I say it virtually perfect, the handles are slightly padded and of a decent length if you want to carry it or put it on your shoulder, and the metal zips feel strong and secure. On the bottom of the bag are small metal studs to protect the base as well. It also feels incredibly comfortable on your shoulder which I was really pleased about. The bag weighs less than a kilo which I think is great for a leather bag of this size, but if you wanted an ultra lightweight version, they also make the same design in nylon with leather edging which is lighter again. 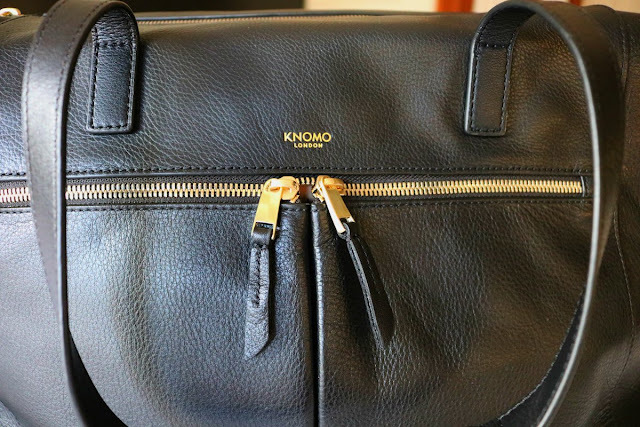 The Knomo Curzon leather bag is spaciously stylish, uniquely useful and fabulously fashionable. It combines organisation with elegance, sophistication with design. 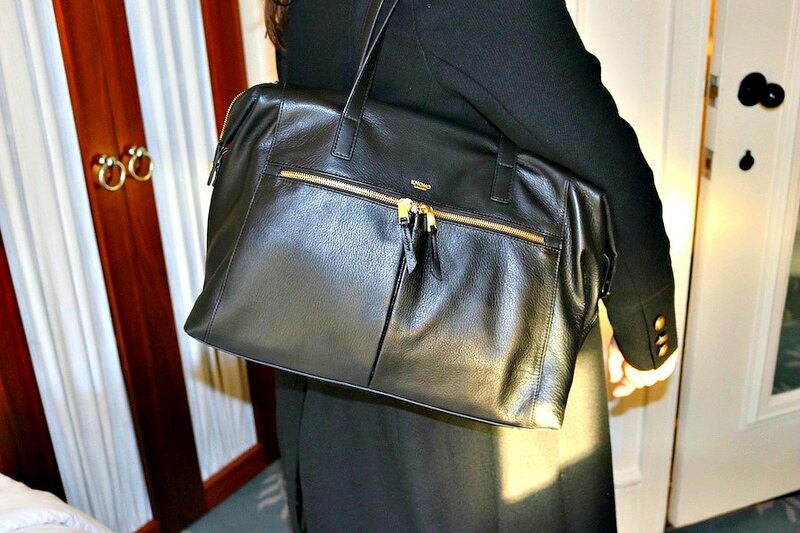 It's that perfect bag to take out to meetings or to use for your travels as a cabin bag. It can hold enough for an overnight stay or even a weekend away if you are clever with your packing. Don't believe me? Have a look at the video below and you will be surprised. I'm seriously impressed with the Knomo range, and I have my eye on the Elektronista digital clutch bag next. A clutch bag with a built in phone charger and lots of pockets for some serious organising. All the bags have a two-year guarantee too. At the moment they have a sale on as well so you may be able to snag a serious bargain! The Knomo Curzon leather tote bag is priced at £269 and for a bag that will last you many years, I feel it's worth it. If you are looking for a stylish spacious tote bag of the utmost quality, you won't be disappointed. Get your #LifeOrganised with Knomo. Highly recommended. That looks a fantastic bag for travelling with, i'l have to mention it to my wife! Those Duffle Weekender bags look brilliant. Nice to know you've ordered an IPhone case thanks Jon. This looks like an amazing bag. I'm a fairly organized person, but when it comes to my purse, it's another story. There never seems to be any "good" place to put anything. Thanks for this! Lots of pocket for perfect organisation too. What a gorgeous looking bag I'd love something like this for whenever I next go aborad. This bag is stunning! I so need this in my life. Organization when it comes to travelling is something I need to work on. This bag is great for organising your travel! What a great bag! I need one of these, pronto! It would be great for every day and for traveling! I hate when bags have dodgy zips so I am pleased this one does its job. I love this bag. That looks great, i love that it has so many compartments! I love how spacious this bag is! And all of those interior pockets would make it easy to organize your belongings. What a stylish tote bag. I love how much space it has for everything. Oh I love this bag!!! It's the perfect size and so pretty! Ever since I had kids, I cannot leave the house without a big bag that could fit a lot of stuff. There are times where in I'd leave with a back pack. I think this one's awesome, there are so many pockets as well! I'm not one for a back pack so this bag is perfect for me, and yes so many pockets. AS I sit in an airport, I'm wishing I had one of these. I've never seen them before and so far, I'm loving them! I love it! Very stylish and looks comfortable to hold, also love the compartments, hate having to rummage through a bag, and get everything out to find something small! I love how stylish this bag is! Organization is key for when traveling! I love that, to the point that I've just bought a Fossil bag hugely similar. Love it. I quite like it. A brown shade would be nice though the natural black leather style is still classy as usual. This could easily spawn a lot of copies, better make sure we get the original one! I think this bag comes in other colours, I know they did a navy version. Best to check out the website! Organization is everything for me! And when I am traveling it is essential to have a bag that keeps my things where I can find them! This bag looks like the quintessential weekender with serious style! Yes its a great weekend bag. I don't do a lot of traveling but I still need this bag! My purses are always too small and I can't organize my stuff well. This bag is the perfect size for me! Yes you don't have to be a traveller to use this, it's just a great well organised and spacious bag. This is a great back and seems like it would be the perfect size for a weekend away. That's a nice looking travel bag. I appreciate the interior pockets. This bag is super stylish without being high fashion, a cool chic weekend bag. My work bags are this and the elektronista! Although saying that the elektronista is never far from me outside of work as well as the organisation it brings to my life is fantastic. You lucky thing, I really want an elektronista! I have a Knomo back pack which I love as it's so practical, but I'm looking at getting this one for more stylish occasions. Their bags are such good quality!